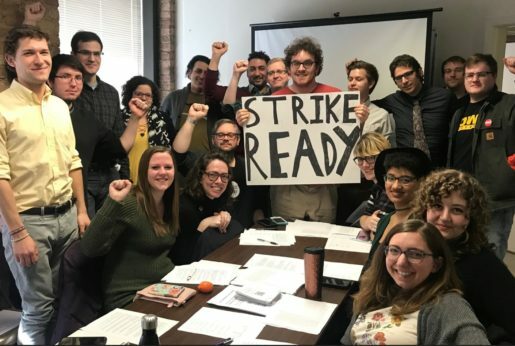 CHICAGO—Hundreds of graduate student staff at the University of Illinois at Chicago (UIC) went on strike this week with employees demanding a fair contract agreement from the administration. The UIC Graduate Employees Organization, Local 6297 of the Illinois Federation of Teachers, is a member-run union that represents more than 1,500 graduate assistants at UIC. 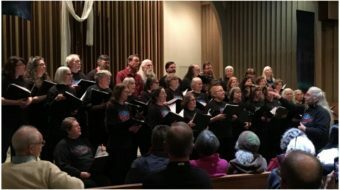 The union’s bargaining collective has been negotiating the terms of their new contract with university administrators since March 1, 2018. The administration’s bargaining team emailed the GEO Wednesday afternoon, March 20—just a day-and-a-half into the strike, requesting a meeting. The two parties, along with the federal mediator, met Thursday at noon for their 23rd session. Anne Kirkner, co-president of the GEO, was one of several members present at the latest negotiation session. She says administrators have continuously refused to budge on their position regarding the “general fee” charged to the grad students by the university. UIC claims the “general fee,” which together with insurance amounts to a mandatory charge of around $2,000 per student annually, covers “fixed” costs at the university, such as utilities and student facilities like campus housing, recreation, and athletic centers. “We waited 15 minutes for the administration’s negotiating team to show up,” says Kirkner, “and when they finally arrived, they informed us they could not waive or freeze the ‘general fee’ due to state law, but they refused to cite the statute.” The entire session lasted less than 10 minutes. Many of UIC’s graduate students are financially struggling; it was recently reported that teaching assistants at the university make as little as $18,000 for their work. In a letter sent out to the student body, the university alleged that graduate employees earn closer to the equivalent of “$62,375 per year.” The email annualized the minimum graduate employee salary from 9-months to 12-months, added the value of tuition waivers, then multiplied it by the number of semesters in a school year. The GEO fired back at the university’s email through their Facebook page, claiming that the number cited by the administration was “make-believe” and fictitious. The union said the reality was “that we are being exploited and that our strike is totally justified.” Most graduate students at UIC do not work 12 months a year, and they typically work closer to 20 hours of compensated work a week, as opposed to the 40 that the university claimed. Several members of the GEO have resorted to off-campus gigs to make ends meet. “I work two extra jobs in addition to my university job,” says Kirkner. “I teach courses with 45 students; I grade everything by hand. If I were a professor there is a good chance I’d be given a teaching assistant.” Working on her Ph.D. in Criminology, Kirkner says half of her salary goes directly to making rent each month. She has also previously taken out small loans to help meet her housing and transportation needs. Not all graduate student employees, however, are able to take side jobs. International students, for example, are often limited to on-campus positions because of their visa status. Kirkner says that about half of the GEO’s membership is made up of international students. 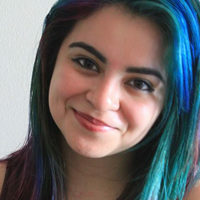 “The administration’s refusal to waive fees is a slap in the face to international students who have to take on additional financial hardships in order to attend school here.” It has also been reported that in recent years UIC has begun charging international grad workers additional fees that domestic students don’t have to pay. Since the strike began, dozens of faculty and undergraduate students have stood in solidarity with the GEO; several professors reportedly canceled classes throughout the week. A number of local unions have also joined the picket line, including UIC United Faculty Local 6456, Chicago Teachers Union, Illinois Nurses Association, SEIU Local 73, Illinois Federation of Teachers, alongside many campus-based organizations. Although graduate student employees hoped administrators would take serious steps in moving negotiations forward this week, they remain undeterred in their resolve. The GEO is currently seeking a 24 percent pay raise over a span of three years—an increase that would bring the average salary for teaching assistants up to $24,000 and make a significant difference for the predominantly working-class members of the union. The union is also proposing a waiver of all the fees paid by graduate workers, an increase in the university’s share of health costs, and a reform to the system for earning appointments to job positions. 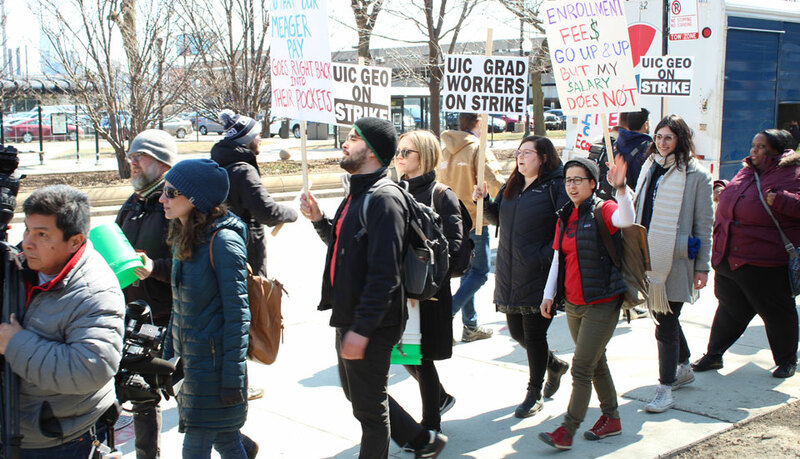 The GEO intends to continue its strike at UIC until the needs of graduate student employees are met and all members are awarded a fair contract. It welcomes and appreciates contributions from supporters to the Local 6297 Strike Fund.